If you ask most people “Who are you?,” after their proper name you’re likely to get a short list of roles they perform in the various social niches of their life. 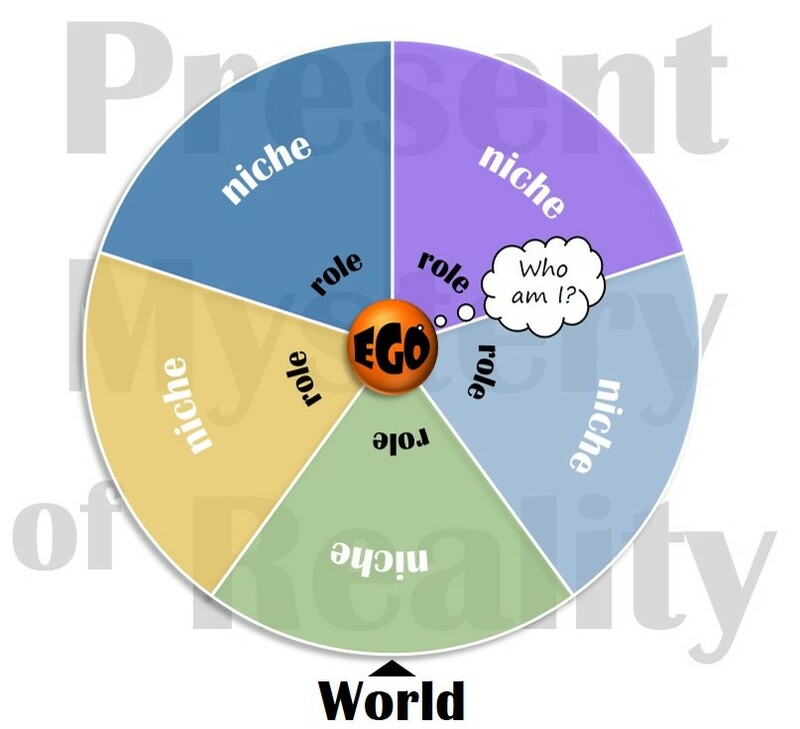 As I use the term, ‘niche’ refers to a particular environment of social interaction where individual members carry identities assigned and scripted by a coherent narrative which they all accept as the story of what’s going on. Every time we step into a niche, we do so at the entry point of a role – unless we are a stranger or an intruder; but even then we will be regarded as a stranger or intruder, which is a kind of role as well. Roles can be thought of as personas (from Greek theater for the ‘masks’ worn by stage actors), and every persona comes with a script that we need to learn and personalize (or make our own). Depending on the niche, a particular role will be more or less flexible in allowing such personalization, but in some cases there is no flexibility whatsoever. The coherent narrative mentioned above is an essential aspect of a niche; you might think of this ‘story of what’s going on’ as the temporal (time) counterpart to the contextual (space) aspect of a niche. All of the smaller interactions unfolding between and among the member roles are contained and validated by the bigger story, and it would not be a misuse of the term to call this bigger story a myth. Myths are narrative compositions that serve to construct our concepts and images of what really matters to us – or, which is more likely, myths make certain things matter to us. A myth establishes what it means to live and act inside its niche: who we are, where we’re going, why it matters, and even what we want. In our family niche, for example, the myth tells us that what we want is security, love, and belonging; these are values we associate with what a family should be (or ideally is). Our own family is a ‘true family’ to the degree it matches this archetype as established in the myth. In a different niche – say, the workplace – other values may attach to what it means to be a member, how we should live and act in that setting according to its primary myth. Maybe not security, but risk-taking; not love, but power; not belonging as much as standing out and getting noticed. Another term important to understand is World, which is not a synonym for the global environment, planet Earth, or the universe at large, but designates the total set of niches where our identity is constructed and negotiated. As each niche has its primary story, or myth, we can call this total set of big stories our mythology – simply the collection of myths that orient us in reality and determine our perspective on what matters. A mythology, in other words, is to our world as each myth is to its niche. The world is therefore a narrative complex of many stories that projects a logosphere or ‘sphere of meaning’ around us, inside of which we wear the masks and perform the roles that define who we are. The normal course of socialization aims at our full identification with the roles we play. This is why the average person you ask will tell you “I am ______” by naming the different roles they play in life. But they’ll probably not use or even think of who they are in terms of role-play. In a simple and straightforward sense they are the personae that the niches of daily life require them to be. This is what I call the First Delusion. Historically our wisdom traditions – referring to the ancient heritage of mystical insights, life principles, and ethical ideals – have served to liberate individuals from this trap of mistaken identity. You are not the roles you play in life but the actor who is playing the roles. Your true self is distinct from the masks, scripts, stories, and stages on which you perform. When you realize this, you will no longer be subject to the vagaries of your ‘audience’ – all those others whose approval, praise, or criticism have been your driving motivation. From now on you can live your life not as a role-performance but in the spirit of freedom and creative authority. The message might continue, however, telling you that just as your roles are temporal (in time), temporary (for a time), and relative to the roles of other players in the niches of your world, your true self is eternal (outside time), everlasting (for all time), and separate from all the drama. There may even be some nonsense about this true self making a ‘contract’ with destiny to incarnate in the fleshy vehicle of your mortal body, perhaps cycling through numerous such incarnations until the moment you see the truth, the truth sets you free, and you can reclaim your divine nature. This I will call the Last Delusion. That added twist on the message – the whole thing about your true self being metaphysically transcendent, immortal, and divine – plays well to an audience that is world-weary, chronically anxious, and self-obsessed. Just like us. Its character as a delusion is focused in the way it diverts liberation from the First Delusion (“I am the roles I play”) by conceiving our ego (the actor) as an absolute center of personal identity, separate and separable from the body, an essentially indestructible unit of pure consciousness from an altogether different realm. The healthy and necessary deconstruction of identity encouraged by our wisdom traditions gets aborted in the interest of saving the ego from extinction. But what’s wrong with that? It’s not necessary to attach a moral judgment (wrong or bad) to this maneuver, but maybe a therapeutic one will make sense. Therapy is concerned with healing, health, wholeness, and well-being – values that are central to a developing spirituality as well. In the early stages of development individuals are guided by society into the First Delusion, where we are expected to carry on with our assigned roles. Thus engaged, we are most susceptible to the instructional download of cultural assumptions, priorities, and aims which are critical to social stability and cohesion. Living by such programs is what Nietzsche lambasted as ‘morality’: getting in line, following the rules, and effectively subordinating our creative spirit to the value-orthodoxy of the tribe. For roughly the first half of life this is how it goes for most of us. The structure and sequence of incentives offered to us – hugs, stickers, trophies, awards, certificates, promotions, and titles – fuel our motivation to play along and do our best. At some point, however, the luster starts to fade and we find ourselves having to muster the effort to keep at it. Only now we are getting a sense that it is all, indeed, a play. Granted, a very serious theatrical production in ‘let’s pretend’, but a pretense nonetheless. And those who really get caught up in it tend to be the most pretentious among us! Lots of research correlates this disillusionment with the transition of mid-life, when all those prizes for conforming begin to feel less interesting or important. Or at least they don’t connect as much to the authentic self we more deeply aspire to be. It’s not all about you. The life you have is transient, and each moment is profoundly precious. Get over yourself and invest in what really matters – not for the reward or recognition, but because in so doing you are fulfilling your reason for being, which is to give your life as a ransom for many. They need to know this shining truth as well, so be a light on their path in the time you have left. And this is also where we might get lured into the Last Delusion, taking to believe that we are above it all, just passing through and on our way to live forever, somewhere else. I probably spend too much time defending the role of religion in our lives, especially in the opinion of those who identify themselves as nonreligious or atheist. While they tend to define religion as a belief system oriented on the supernatural, driven by superstition, stuck in the past, prone to fanaticism, and utterly irrelevant to the real challenges of our postmodern experience, I don’t regard any of those components as essential to religion. It’s not the components – these or any others – that properly define religion, but its function in connecting and holding them together as a coherent worldview and way of life. Properly understood, religion is the world-building enterprise that has preoccupied humans since our evolutionary arrival to the scene. Its principal task has always been to nurture and refresh the connection between an objective realm of observable facts (around us) and a subjective realm of intuitive feelings (within us). Just in case my reader is about to resurrect the overworked dualism that pits facts against feelings, where facts are reliable data about reality and feelings are … well, only feelings and nothing we should count on, we need to be reminded that facts are still constructions in the mind and not simply what is ‘out there’. “That, over there,” you’ll reply, and proceed to describe what you’re looking at. But of course, over there only makes sense as a proximal location from our shared point of reference (here), and the words you use will carry connotations from the echo chamber of language – assumptions, for instance, regarding how properties adhere to substances, how single objects are distinguished from their surroundings, how entities are different from events, what associations inform your concept of it, the degree in which my concepts and assumptions match yours, and so on. In other words, whereas the objective realm of facts appears as if it is separate from the mind, our perceptions, assumptions, and representations of it hold space nowhere but inside the mind. At the same time, our mind is registering a subjective realm of internal feelings – or as we should more properly name them, ‘intuitions’. These are no less real than the facts we observe, just real in a different way. The bias of Western epistemology favoring empirical knowledge of the objective realm has preferred to throw intuition under the bus when it comes to providing information we can count on. A tricky question has to do with what, exactly, intuition reveals – and that word is chosen carefully as well, since the concept of withdrawing a veil is so prominent in religion. What it reveals is not an object, but, in keeping with the subject-object duality of consciousness, something that has been metaphorically represented in subjective terms as the Supreme Subject, the creative source and essential ground of being itself, or God – not in the sense of a supernatural or metaphysical entity, but the grounding mystery of all things. The ground of being cannot be observed as separate from us, for it is the deepest truth of what we are – as human manifestations of Being. Religion, then, speaking more historically perhaps than to its present forms, has the task of keeping the self-conscious center of personal identity (my “I,” your “I”) oriented outwardly to the objective realm by way of a relevant model of reality (or cosmology) and simultaneously oriented inwardly to the grounding mystery within. Over its many millenniums – except in the present day for many believers – religion has worked to align the outer and inner, the universe as we know it and the ground of being, thereby supporting a sense of our existence as grounded in a provident reality. As our conscious engagement with these two realms has evolved, we’ve come to regard them by the terms ‘science’ (engaged with reality external to the mind) and ‘spirituality’ (engaged with reality internal to the mind). A shorthand definition of religion, therefore, conceives it as a dynamic system of symbols, metaphors, stories, and sacred performances (i.e., rituals) that maintains a relevant conspiracy of science and spirituality. The stories it tells are a braid of theory (explaining the objective realm) and myth (revealing the subjective realm), which until very recently were complementary narrative strands in our self-conscious engagement with reality. The product of these two strands working together is what constructivism calls our ‘world’, which exists entirely inside our mind, or in what I have named in this context the imaginarium of belief. 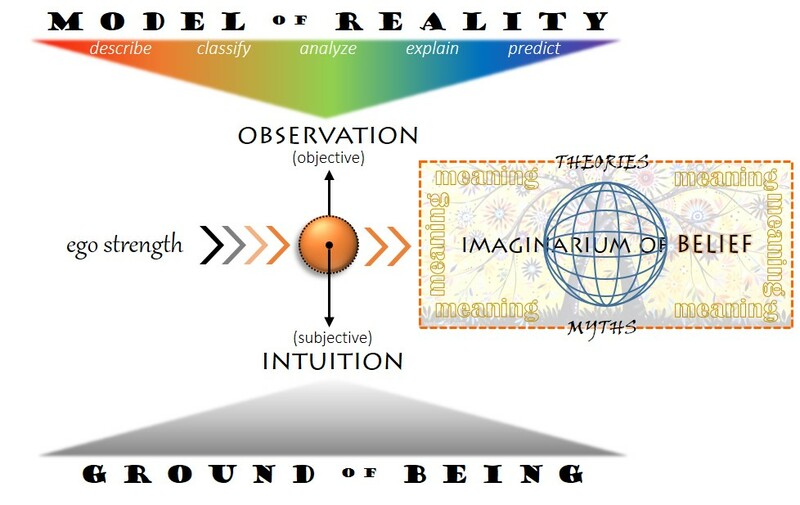 As suggested in my diagram, our world opens outwardly to the objective realm and inwardly to the subjective realm, situating us meaningfully within the present mystery of reality. When all is working well, our knowledge of the universe (out and beyond) is relevantly aligned with our intuition of communion (down and within). Religion is relevant and effective and doing its job. But things do fall out of alignment. Science can move so fast and far ahead in its discoveries that the myths of religion can’t keep up. This is what happened in the West. The myths of creation, providence, and salvation were composed on a cosmological framework arranged vertically in three levels (Heaven, Earth, and Hades or hell). For our salvation Jesus came down from heaven, lived and taught and was killed, at which point he went farther down, but then came up again, and a little later went still higher up, back to heaven where he is currently preparing for his final descent at the end of time. All that up-and-down business made perfect sense against the backdrop of a three-story universe. Not so much in one that is expanding radially and has no absolute vertical orientation. Another kind of disorientation happens when our inward sense of grounding is lost. Trauma, tragedy, and chronic stress can sever the anchor-line of faith in a provident reality, motivating us instead to latch onto something we can control, which the Buddha called attachment and the Hebrew prophets idolatry. Idols can range from physical statues, orthodox doctrines, and mental concepts of God, to anything we believe will make us happy and secure (e.g., wealth, possessions, status, glory, or even a utopian “no place” like heaven). We can’t get close enough to, or get enough of, what we hope will make us happy and secure because nothing can. The more desperate we become and the harder we try, the farther we get from our true center. When such anxiety overtakes an entire culture and historical era, a consequence can be that individual development is compromised – particularly in regard to the critical achievement of ego strength. This term shouldn’t be confused with ego-centrism, where an individual can’t consider any reality beyond his or her own urgencies, ambitions, and convictions. Ego strength is the goal of individuation, of becoming an individual with a unique center of personal identity and creative authority. Because anxiety motivates attachment and attachment interferes with individuation, such individuals lack a stable center and have a neurotic need for their world to stay the same. They refuse to accept the new scientific model of reality, and they can’t drop their attachments for a deeper (transpersonal) spirituality. Their religion tends to be oriented on the supernatural, driven by superstition, stuck in the past, prone to fanaticism, and utterly irrelevant to the real challenges of our postmodern experience. Their religion, not religion itself. The world to come might be more of the same, which is bad news for everybody. Or it might be different, but that’s up to you and me. A lot has happened to get us to this point, where I have written something for you to read and think about. Fourteen or so billion years ago a quantum singularity broke open to release a burst of infinite energy and give birth to our universe. Within seconds this highly unstable state began to collapse into the first forms of physical matter: superstrings of light, crystalline lattices, and quarkish free radicals that would soon (over the next 150 million years) cool, combine, and form into thermonuclear furnaces of the first stars. Much, much farther into the future (only about 4 billion years ago) the conditions of organic chemistry necessary for life to emerge gave rise to the first single-celled organisms. Since that point, life has continued to evolve into microbial, plant, and animal forms, developing ever more sophisticated sensory apparatuses and nervous systems among the animals to support an awakening of consciousness. In the primates, and particularly the hereditary line leading to our own species, this power of sentience acquired the talent of self-awareness, where the formation and management of a personal identity (ego) has now become our constant preoccupation. So here I am and there you are. We are just conceited enough to half-believe the rumor which says that we’ve made it to the end, that our species has finally reached self-actualization with the arrival of ego consciousness. The great universal process has been evolving all this time with the aim of achieving an intellectual comprehension of itself in us. This is what the German philosopher Georg Wilhelm Friedrich Hegel believed at any rate. With the rise of consumerism we’ve managed to put a twist on Hegel’s idea: our special gift is not so much intellectual curiosity as an insatiable craving for what will make us happy. And nothing can make us happy (such is the open secret of our wisdom traditions) which is why we can’t seem to get over ourselves. It’s like we’re this black hole at the finishing end of evolution, fourteen billion years after the birth of the universe from a primordial black hole. But whereas that one was a spring of creative energy, we have become a sucking drain on the resources of our planet and its fragile web of life. As long as we continue to regard ego consciousness as the cosmic endgame we won’t be able to change course from a tragic conclusion in global intoxication and our own extinction. If we can’t shift from our present condition to something more liberated and life-affirming, the final outcome decidedly won’t be in our favor. In other posts I have described what I call the three pernicious divisions currently compromising wellbeing and threatening our future. 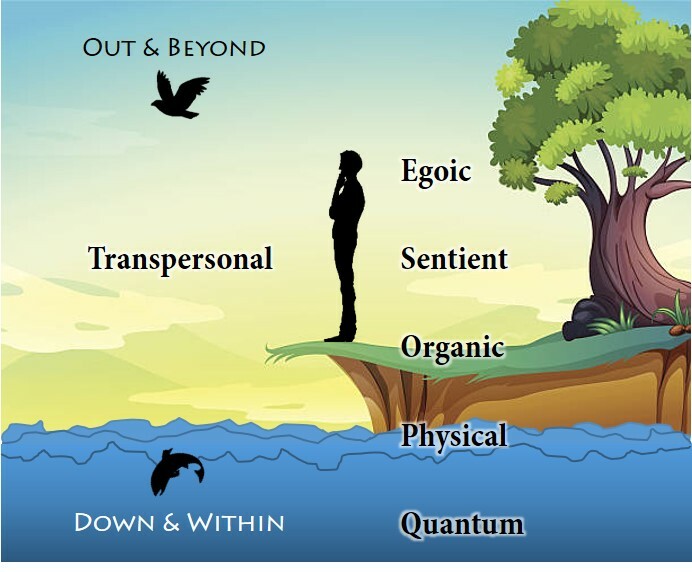 A psychosomatic (soul-body), interpersonal (self-other), and ecological (human-nature) division that breaks the creative polarities of our existence and sets them in opposition (soul without body, self against other, human above nature) undermines our essential wholeness. I’ve argued as well for seeing theism as a necessary stage in the construction of personal identity (ego) and the social system around it. In its central statement concerning the nature of ultimate reality in terms of personality and will (i.e., the concept of deity), theism provides a stage for our individuation as self-conscious centers of personal identity. Just as a healthy family system lends provident support and inspiring role models for children in the taller powers who manage the household, so in theism this same arrangement – at least by design – is projected at the societal level. In this household we (first and foremost the insiders) are siblings with one another and children of a god whose will is that we live peaceably together, contribute to the greater good, and grow in virtue. I characterize theism this way and not as a belief system based in supernatural revelations and miraculous events – which is how it is typically spun by orthodoxy to insiders – for three reasons. First, my characterization is deeply consistent with the evidence we have from the history of religion itself. Secondly it saves theists from having to abandon their common sense, moral conscience, and modern worldview for the sake of holding to a literal reading of their myths. And finally this model of theism allows for a more responsible and well-reasoned interpretation of a spirituality that thrives beyond the ego, after theism, and on the other side of god – what is named post-theism. Where does this post-theistic spirituality lead? Not to a hard-line atheism or secular humanism. I’ve clarified these distinctions in other posts, so we’ll move directly to what is unique to post-theism. Post-theism is transpersonal, which means that it engages with reality beyond ego consciousness. Rather than eliminating ego from the picture, however, this spirituality focuses on making personal identity sufficiently strong (i.e., stable, balanced, and unified) to support the breakthrough experience of a liberated life. Personal identity continues to be important here as it was in theism. But whereas theism – particularly, I should qualify, in its healthy forms – made ego strength its primary concern, post-theistic spirituality invites us to an experience of reality below the center and beyond the horizon of ego consciousness. These terms “center” and “horizon” are important to understanding post-theism because they serve to define membership – how we identify ourselves and where our obligations lie. We can clarify them further by saying that our center is what we identify as, while our horizon represents (or contains) what we identify with. At the level of ego consciousness we identify ourselves as individual persons with unique histories, personalities, and interests: I am a person. Taking this identification means that we also identify with other egos: they are our companions, colleagues, rivals, opponents, and enemies inside the horizon of specifically egoic concerns. As just mentioned, theism is a social system constructed for the purpose of forming personal identity and developing its potential. Even though it conceives a deity who brought the entire cosmos into being, theism’s primary investment is still in shaping the beliefs, values, and aims of our interpersonal life together in society. Its notion of salvation is centered on our need as persons to be accepted, recognized, forgiven, and reconciled to the tribe that holds our membership. Below our center of personal identity (or ‘down and within’) are deeper centers corresponding to larger horizons of identity (‘out and beyond’). Whereas we are unique individuals at the egoic level, by dropping to the deeper center of our life as sentient beings who can sense and feel and suffer, we also identify with all sentient beings. The values and concerns that orient our existence now include much more than other egos. Drop another level to a still-deeper center and we identify ourselves as organisms, or living beings that exist interdependently with countless others in a great web of life. Now our values and concerns open transpersonally to an even larger horizon where we recognize our influence, for good or ill, as well as our responsibility within the biosphere of our living planet. From this center of our life as organisms we can only contemplate the material and quantum realms farther below (and within) as the ineffable ground of being itself. And altogether, from this dark abyss of energy and matter, focusing upward through the realms of life and sentience whose rhythms and animal intuitions support our unique center of personal identity, is what I name the grounding mystery. With each center up or down, our awareness expands or collapses to its corresponding horizon. The capacity for diving deep and flying high in this manner is a transpersonal capacity, and it takes ego strength to make it possible.